or the natural habitat of featured snippets. If we rewind the Google history a bit, we will see that the search results looked kind of the same: headline, breadcrumbs, and meta description. Now with the help of Schema markup, for example, we can grasp much more information right from the SERPs. The suitable result can be at any position, usually in the top 10. However, there is a sacred place, so called "position zero" that anyone can occupy. Some background on featured snippets. Position zero is the place above all the regular search results. This position is devised to contain a featured snippet, or a rich answer, in an attempt to answer the user's query in the fullest and most concise way. Plus, if your website gets a featured snippet, then it is always shown twice in the SERPs. 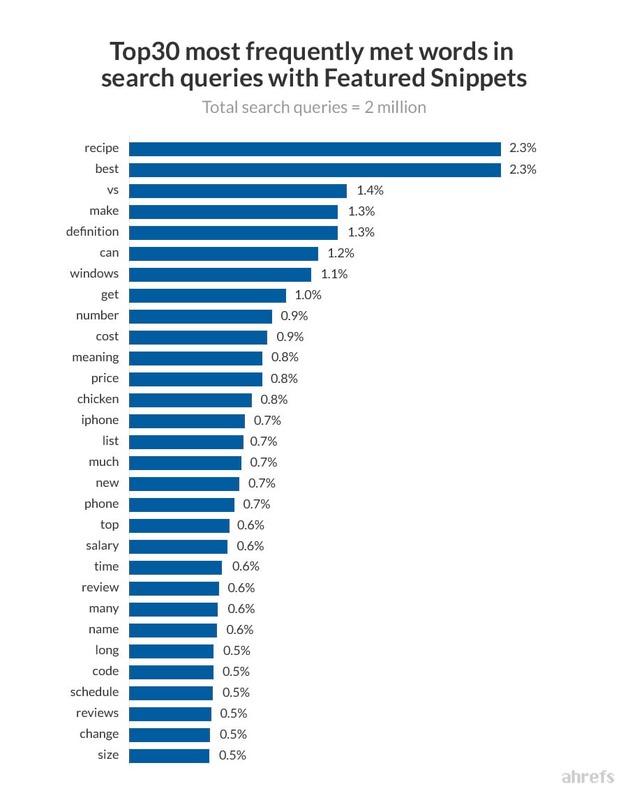 At this writing, featured snippets appear in 12.65 % of search queries, according to RankRanger. Talking about the history, we have seen something similar to the featured snippets before. I mean, Google released its Knowledge Graph in 2012 and Answer Box in 2013. However, the information for these was sourced from the Google's database. For featured snippets, on the other hand, the results come from third party sources. It is basically a brand new way to get quick and reliable answers to the users' queries. Yes, featured snippets are volatile. You can see a particular search result at position zero, and then an hour later, it won't be there. However, this moment of glory may cost a few positions in the SERPs. Check this out: the site traffic before and after the page got the rich answer. What does it mean? To pull out the featured snippet, Google does not solely rely on its usual algo for ranking (i.e. ideal backlink history and great keywords). Otherwise, it would use the first snippable fragment from the highest-ranking page. It would never have to go to Page 2 or further to find a decent result. Some snippets may increase the CTR of your website, especially when your rankings are lower than top positions. At the same time, a snippet can decrease the CTR of the top ranking page, as the users may get the satisfactory answer to their query already from the snippet — there is no need to click further. All in all, a featured snippet is a legible SEO shortcut to the higher positions of the search results. You know, if you are at the first page of the results, but rank at positions 2-5, it is difficult to get closer to number 1. But instead of competing for position 1, you can score position 0! It basically occupies the whole screen space! And after that, try to do a voice search for the same thing. It will read to you, guess what, this very featured snippet. Imagine you do not have the possibility to look on the screen at this moment. Then this answer will be your first and only. It totally makes sense in our speeding mobile world where we have already gotten used to obtaining information at the very instant we have thought we need it. How to get to position zero? Step 1. Figure out whether you really need it. Before you dive into all the technicalities, you have to ask yourself whether you really need to get a featured snippet for any of your pages. If some parts of your website are oriented on giving clear answers to any frequent queries, then arm yourself with the information below and go! Remember that not all the markets are equal when it comes to be snipped. For example, if you run a local business, you better concentrate on Google Maps results, as according to the study by STAT Search Analytics, local pack results are not seen as featured snippets in the SERPs. However, after 6 months STAT updated its study and found out that one of the low-rate categories moved to the opposite column. That was subjective queries, like reviews and recommendations. It means that the snippet business is very finicky, so once in a while you have to feel the pulse of the ongoing situation with the featured snippets stats. Step 2. Check engagement metrics. I've mentioned that featured snippets are highly volatile. If you already have one, it does not mean you will keep it. There can always be someone who has managed to give a better answer than you did with your page. Larry Kim illustrated this in his experiment with lower ranking pages that managed to receive a featured snippet. By analyzing around 50 pages with such prerequisites, he made the conclusion that dramatically high CTR and session time, which were common for all these pages, drove them to position 0. To support this theory, we can remember the algorithm Google used for the right rail AdWords, now obsolete. Currently, up to three ads appear above or below the organic search results. So how does Google decide which ads to show? To add to that, WordStream have transparently shown the strong relationship between CTR and Quality Score. That's why we have a right to believe that featured snippets work the similar way, with engagement metrics being the core element. Your website should be in a proper state to claim the real estate of position 0 before your competitors do. As you may remember, featured snippets come more frequently from the first page of the results. The first page per se requires good engagement metrics. However, there is always room for improvement. Use Google Analytics to check the pages that can be snippable, in your opinion. If you see that their engagement factors (like bounce rate, CTR, session duration, new visitors, number of visited pages, etc) are lower than average, it means that these pages are not what users really look for. As Google always tries to give its users the best search experience, it will unlikely choose the page with the poor metrics as the best answer to the query. In the end, it boils down to the fact that you have to provide awesome content to satisfy users, to obtain a featured snippet, and what is more important — to keep it, once obtained. Step 3. Make your content snippable. When you start to read the tips on how to get a featured snippet, all the roads will lead to one common point — create the best content and you will nail it. It is a very important point indeed, but I dare say that it is not enough. You have to make Google see what a great supply of answers you have. Otherwise, your swifter competitors will outgun you with their little ways and flash their answers at position 0. What are the little ways, you may ask? I have compiled a few below, please check. wrap up with examples or case studies. First of all, to think of the best answer, you have to identify a simple question that users may ask when searching for something related to your area of expertise. Here try not to fall into a trap with the Knowledge Graph. I mean, many of the questions that you can think of may generate direct answers from the Google database. When you ask a question and understand that the answer is a matter of a simple fact, like somebody's birth date, then it is a so called factoid, and it will be shown as Knowledge Graph. Thus, your question should be more complicated and require a more substantial answer. SEMrush did the analysis of 100,000 keywords and found out that the average length of a keyword phrase with a featured snippet is about 6 words. 5 Ws (Who, What, When, Where, Why) + How questions. Here the Why and How questions attract snippets best of all, as they require more explanation and cannot be easily answered with factoids. Why-questions usually produce a paragraph-like snippet, like here when I asked "Why are clouds grey?" How-questions, as a rule, trigger some practical advice, usually showing a list. Here I asked "How to watch a solar eclipse?" Moreover, snippets for why- and how-questions usually serve as teasers and provoke the users to explore further by clicking the link. Users usually do not type in the query with a question word but they surely imply it. For example, you may just type "CTR", however, in your head the query sounds like "What is CTR?" Google will also recognize it as an implied question. Beware, common words will trigger a dictionary entry instead of a featured snippet. So the question that you devise should ask for more specialized knowledge that cannot be reduced to a simple dictionary definition. A good way to get more ideas on search queries is by consulting "People also ask" box in the SERP. 2) Go to the Keyword Research module and click Suggest Keywords . 3) Pick the Google Autocomplete suggestion method from the list. By typing or pasting your questions with wildcards to the tool (i.e., what *seo*, how *seo*, etc.) you will receive tons of suggestions related to your keywords. You can filter your results by the important metrics, like Number of Searches and KEI, and comprise a list of questions that cover your niche. Well, by now you have in mind the variety of the questions that should cover the content that you want to compete with for a featured snippet. The content optimization in this case calls for good old keyword search. Keywords building via word combinations and typos. Step 4. Optimize the format. Great content deserves decent wrapping to let Google efficiently pick up the information for the featured snippet. By wise HTML formatting, you can guide Google to the necessary spots to retrieve the data for the answer box. Moreover, the suitable format may help you either to steal position zero from the page with weaker formatting, or to keep your page on this position — any moment you may lose your snippet to a site coming from nowhere. In case of any of these scenarios, try to check whether everything is in order according to our guidelines below. If your snippet is stolen, try to analyze why Google considered this intruder to be better than your page is and apply the changes to your page accordingly. This single answer paragraph should be about 40-50 words to fit in the answer box. Put this paragraph right under the heading for the question. Google loves to include tables into the featured snippets, as they are much easier to understand for computers, unlike natural language paragraphs. So when it makes sense, add the tabular data or reformat suitable paragraphs into tables. Give this list a title that matches the targeted keyword. As Google can make its own lists out of the text instead of snipping the paragraph, you can format your text with subheadings (H2) where it is logical to do so. Then Google will take your subheadings and list them chronologically. Featured snippets of a list type can be tricky in a way that by giving all the steps in the answer box, you discourage users to click the link to your page — they have already got all the necessary information! Thus, try not to lay all the cards on the table — format the text the way to save some no less important steps from the users' view. In this case Google will give "More items" link. And that is a call to click! If your page's content updates regularly, use a "last updated" tag. In this case Google and users understand how current you post is. Step 5. Request indexing by Google. We recommend to use Google Search Console to re-crawl your pages. Apparently, this request almost instantly updates Google's index of the page. It means that your page can gain a featured snippet the same day you did re-indexing. 1. Log in to Google Search Console. 2. Expand the "Crawl" menu and click "Fetch as Google." The exciting thing is that now, with the introduction of SERP Features, SEO PowerSuite's Rank Tracker allows you to track whether any of your pages have got a featured snippet for any of your keywords. Just open Rank Tracker, create a project for your website if you do not have one, and by going to Preferences > Rank Checking Mode, make sure that Track organic results only box is unchecked, and the Track multiple results for keyword box is checked. Once you've done this, SERP features will be tracked along with the regular organic results every time you check rankings. To add the Google SERP Features (or Google Mobile SERP Features) column to your Rank Tracker workspace, right-click the header of any column and check the boxes next to the name of the column you'd like to add. Once you have refreshed your rankings by selecting all or any particular keywords and clicking Check Rankings, in the column Google SERP Features you will see different kinds of icons that stand for various SERP features (if any). Luxuriously enough, a crown icon stands for featured snippets. When it is grey, it means that there is a featured snippet on this page for your keyword, but the snippet is not yours. But when it is green — you've got it! You can also hover your mouse over your rank and click on the arrow to see what the actual SERP with these features looks like. Plus, if your website was found on the SERP more than once, you will see the three dots in your rank, by clicking which you will summon all the results. With the help of this new feature, you will be able to not only track the volatile behavior of your featured snippet (when you get it and when you lose it) over a period of time, but also to do the same for your competitors' websites. To do that, make sure you are in the Rank Tracking dashboard, and switch to SERP Analysis in the lower part of the screen. Click Record SERP data to start collecting SERP history. Mind that to use SERP Analysis, you need a Professional or Enterprise Rank Tracker license. Once you've done this, go on and check your rankings — the history table will populate with data as soon as the check is complete. In the drop-down menu in the top left corner, you can pick the search engine you'd like to see the history data for. All your users need is the awesome content that answers their queries in full. Google needs what users need. So this "great content mantra" is not overrated. You cannot target all the possible featured snippets for millions of keywords. Your final goal is not to compete for position 0, it is really to give the users what they need with a small push of suitable formatting. If you complete this goal, then you will find yourself on the stairway to position zero.